Everyone loves free stuff, don’t they? And even more so at this time of year, when your budget might be stretched. All the more reason to take advantage of Apple’s forthcoming 12 Days Of Christmas promotion that will run, as it did last year, from December 26th until January 6th. 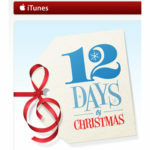 Each day, the iTunes store will be giving away one free gift, in the form of a music, video, or app download, available for 24 hours. There are some easy ways for you to make sure that you don’t miss out on any of the offers. The first, if you own an iPhone or iPod Touch, is to download the free 12 Days Of Christmas app from the iTunes store, which will notify you via push notifications when each gift becomes available. The second way is simply to sign up for e-mail alerts at the special 12 Days Of Christmas website at the following link. Finally, if you’re a Facebook addict, and spend most of your time there, you can become a fan of iTunes (UK), and the free gifts will appear on your news feeds. This entry was posted on Sunday, December 20th, 2009 at 11:50 pm	and is filed under News. You can follow any responses to this entry through the RSS 2.0 feed. You can leave a response, or trackback from your own site.